See the how-to article "Three Cuff Bracelets" for some insider tips on my popular wristwear! 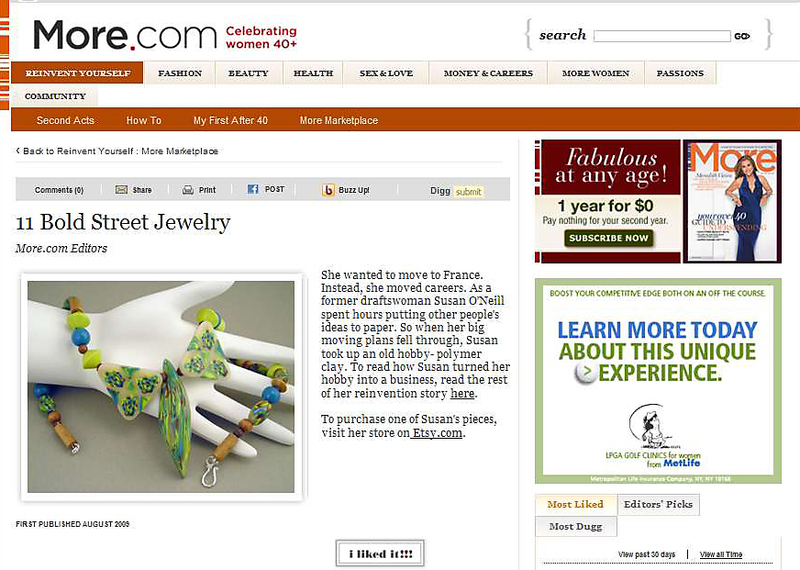 Featured along with Gera Chandler in Polymer Clay Daily! Check out the current Spring 2013 Issue of The Polymer Arts - I'll give you some ideas about working with layers! And, in the Spring 2012 issue, see my "Chopped Translucent" technique, as well as a feature as an Emerging Artist. I was very honored to have garnered a 1st Place honor on Voila, a premier international site for polymer artists! My Zebra valet, created from a transfer of a photo that I took in Kenya on the Maasai Mara. One of my polymer cuffs has earned a 3rd Place honor on Voila, a premier international site for polymer artists! I'm so thrilled! 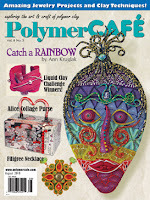 My August copy of Polymer Cafe came in the mail today, and my Copper Red Gauze Cuff was on the cover! I entered the magazine's challenge which had a "Liquid Clay" theme back in February. To my delight - I won 1st Place! A BOLD New PC World! Thanks to fellow member Deb Tuchsen, aka "Renaissance Gal of San Antonio" for a wonderful blog feature to promote the March PCAGOE Challenge "Texture". There are 31 outstanding entries, and I am honored to be amongst such talent! Cynthia Tinapple spotted and kindly featured one of my newest creations in her polymer blog! Petra, one of my talented fellow PCAGOE members has graciously featured me in her blog, Crazy Day Design - my first accolades in a foreign tongue! 11 BOLD street got a mention from Polymer Clay Daily, one of the most esteemed online newsletters for the polymer clay community. Thanks, Cynthia! OFFICIAL BEAD STAR RESULTS: 1st Place in Plastics Category!!! It's official!!! My neckpiece won 1st Place in the Plastics Category in the 2nd Annual Bead Star 2009 Contest!!! Yes, I (and all of my fellow PCAGOE members) would have liked a dedicated "Polymer Clay" category, but that probably won't happen. 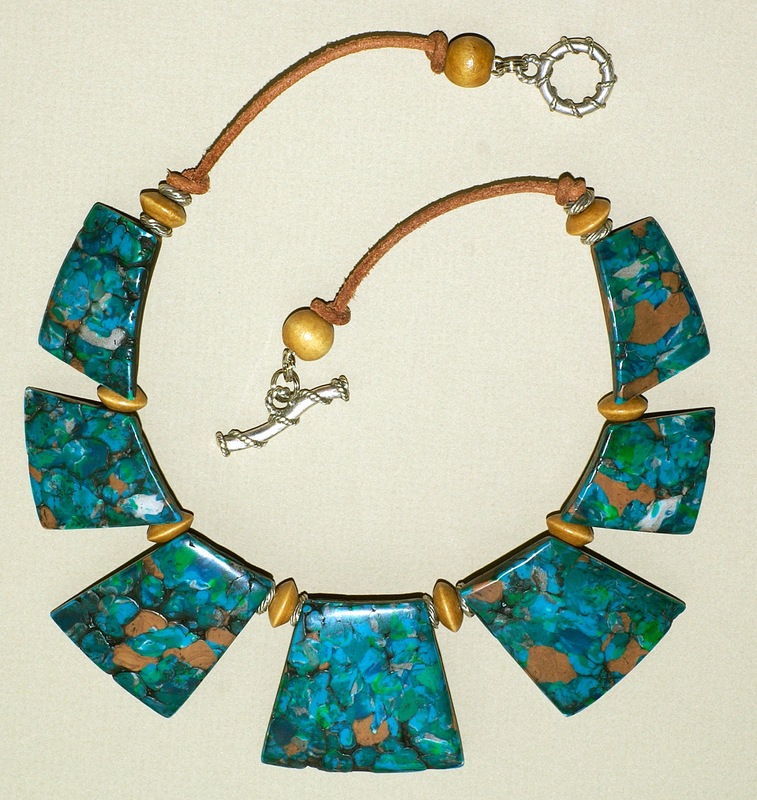 Afterall, one of the contest's likely purposes it to promote pre-made beads and the purchase thereof. Well, polymer clay artists do purchase a lot of beads, but we also create a lot of them ourselves from raw material. Anyway, I'm honored that over 26,000 online voters made their choices, and that without knowing for certain what material they were viewing, picked a piece made almost entirely of polymer clay as the winner! This piece IS CURRENTLY BEING AUCTIONED on eBay, with proceeds to benefit the American Heart Association's women's heart-health initiative. My design efforts were validated earlier this year when I submitted a piece of my jewelry for consideration in the BEAD STAR annual contest. To my surprise and delight, "Fantasy Turquoise Choker" was chosen by the Bead Star Staff as one of the "Plastics" category finalists upon which online viewers could vote! I'm also excited that MORE Magazine chose to publish a story about my creative journey in their "Second Acts" section of the online magazine! A talented artist and instructor, plus fellow PCAGOE member, Eugena Topina graciously featured several of my pieces on her blog. Click here to check it out.